Back again and this time we have the last two episodes of season 4, which mark the end of the first era of the show. We start on another world with SG-1 arriving through the Stargate only to be attacked and surrounded by a group of Jaffa and natives. One of the natives claims to know who they are, identifying them as SG-1, to the confusion of the team. According to the native this planet was one of many SG-1 helped free and then told to bury the Stargate but the Goa’uld came back by ship and re-enslaved them. During the monologue however O’Neill escapes but the others are brought before Cronus’ First Prime. Later that night the native, called Darian, returns home to his wife who is acting strangely, revealing that O’Neill was waiting for him to return home. It turns out this version of SG-1 are the copies from Tin Man back in season one, still sporting their old MP5s and old ranks, with Carter still a Captain. After questioning the native for answers O’Neill slips out after telling them to close their eyes. Disguising himself as one of the natives he manages to sneak into the pyramid on the planet, where the other members have been brought before Cronus who has arrived to take vengeance on the team. Cronus has Darian kill Daniel, as a test of his loyalty, to reveal that Daniel is an android, the shock of which is displayed clearly on Cronus’ face for all to see. Meanwhile at the SGC the base receives contact from Harlan, the android who created the copies of them, and agree to let him through despite O’Neill’s objections at letting the annoying man through. Harlan explains that not soon after the original SG-1 left the Carter copy invented a battery pack so they could spend more time off-world and therefore could continue acting like the real SG-1. The packs however only last for 48 hours before failing, meaning that the copies only have a day left to live. Despite the lack of concern over the others Hammond agrees to allow SG-1 to go on a mission to rescue their copies if they so choose to do so. The SGC decide to send a MALP through the Gate to scout out the situation, finding the Jaffa guards on the other side neutralised by the O’Neill copy, who is soon joined by Darian who now believes that Cronus is not a god. SG-1, minus Daniel who is off-base, decide to help out the planet but the two O’Neills start squabbling almost immediately. After getting them to stop the team move out as Jaffa horns start sounding, likely discovering the guards at the Gate are down. Elsewhere one of Cronus’ lackies is torturing the other copies for information about SG-1 and their technology. 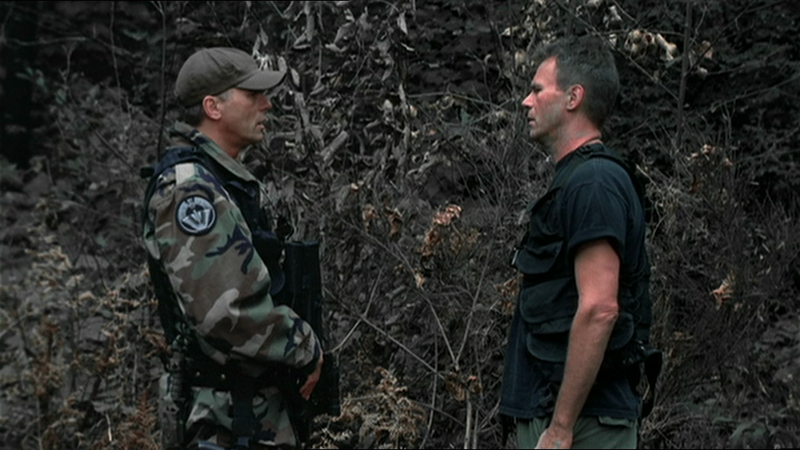 The copies receive word from their O’Neill counterpart via internal radio that the others are planning an attack and agree to help in any way they can, with the copy of Teal’c requesting to meet with Cronus and managing to kill his guards while Carter has the lackey set off the Daniel copy’s battery as a makeshift bomb. On the surface the makeshift team manage to secure the transport to Cronus’ orbiting Ha’tak but the O’Neill copy is heavily injured in the process. Using the confusion caused by the makeshift bomb the Carter copy brings the others on-board via the transport rings. The team split up, with the Carters and original O’Neill look to seal off parts of the ship while Teal’c goes to help his copy, now seriously injured, defeat Cronus. While their plan works as intended, leaving SG-1 with a Ha’tak of their own, the Carter copy is killed when a forcefield around the controls drains her power and both the Teal’c and O’Neill copies succumb to their earlier injuries. Before he dies the O’Neill copy asks his counterpart if they’re really so different, with the two agreeing that they’re not. As an episode Double Jeopardy, along with the multi-episode story to follow, largely acts as a closer to the first era of the show but also partly shows the otherside of story regarding the planets the team help out. For the former the episode brings back the android copies of the team created all the way back in season one by Harlan. We find out that over the years they’ve mainly been doing exactly the same as what the original SG-1 were doing; exploring and helping out other planets in the fight against the Goa’uld. This time however their paths cross with the copies finding a planet that had been freed from Heru’ur by the originals but has since been taken over by Cronus. This not only shows that many Goa’uld have taken advantage of Heru’ur’s demise at the hands of Apophis back in The Serpent’s Venom but that the often used ‘bury your Stargate’ routine isn’t that useful, with the Goa’uld using ships to reconquer world deemed important enough. Despite these points I do think the show missed a trick by killing off all of the counterparts in this episode while the originals survived. If Carter had died for example but her copy survived the idea of the team having to adapt to an android on the team and the copy having to somehow reintegrate despite being 3 years out of touch with her friends could’ve been an interesting move by the show and added an extra dimension to the fact so much of the show relies on the comradery of the team. Overall however the episode remains a good one that sees the team finish off a long standing minor enemy and tie up some loose ends before the season finale that is to come. · I wouldn’t trust this Darian guy. He switches sides very quickly. · I find it odd how in this episode they refer to the different parts of the Ha’tak, such as the Pel’tak pyramid, which never really happens again. · The idea of O’Neill fighting himself is one that is really easy to believe. “Then it would seem your robot counterpart is equally as good at following orders as you.” – Hammond and O’Neill on the copies’ escapades. We begin inside the Tok’ra base on the planet Vorash as Tanith and another Tok’ra converse about an arriving Ha’tak, which turns out to be the one SG-1 captured in Double Jeopardy. It turns out the plan is to use the Ha’tak to transport the Tok’ra to a planet not in the current Stargate network, making their location more secure, and finally eliminate Tanith as his usefulness has come to an end. At a meeting the team and Jacob/Selmak reveal their knowledge of Tanith’s duplicity and place him under arrest until they can remove him from his host, with Teal’c later meeting with him to gloat about his fate remarking that it will be most painful for the symbiote. Some time later Tanith fakes a seizure as an attempt to kill the host using it as an opportunity to overpower his guards and escape, alerting Apophis to what is happening. With Apophis now on his way Teal’c and O’Neill lead a Tok’ra search party for Tanith on the surface while the others help plan what to do about Apophis’ fleet. Carter and Jacob/Selmak decide to use the Stargate connected to the black hole Gate from A Matter of Time to force Vorash’s sun to go supernova, taking out the fleet in one move. Surprisingly the usually more reserved Tok’ra High Council has agreed to the plan. Realising that Teal’c will be the weak link due to his unresolved issues with Tanith Daniel goes to talk to the Jaffa and, while he is able to secure the agreement of Teal’c, the Jaffa claims that this will be the last time he shows such restraint when it comes to Tanith. After the Tok’ra are evacuated and with the fleet only an hour away the team begin their plan, connecting the Gate and launching it towards the sun. The Ha’tak however comes under attack from a Goa’uld Al’kesh, a cloak-equipped medium-range bomber craft, which manages to significantly damage the mother ship. With ship weapons down Teal’c and O’Neill take a Death Glider to attack the bomber, managing to take out its engines as it flies towards Vorash, crashing into the desert planet. The Death Glider also crashes however when Teal’c refuses to pull up during the chase with the Al’kesh, leaving the pair stranded on the planet. While the two of them are walking on the planet they come under attack from an advance team sent by Apophis to rescue Tanith, with Teal’c taking a blast to the back. While O’Neill is able to take out the Jaffa he only manages to wound Tanith, who takes Teal’c back to Apophis via transport ring. The rest of the team, still on the Ha’tak, use computer controlled Gliders to draw the fleet away from Vorash so that they can mount a rescue mission. The attempt is successful, with them able to pick up O’Neill and go to hyperspace moments before Vorash’s sun goes supernova, taking out Apophis’ fleet. The team’s ship however is caught in the effects of the blast, knocking them out into deep space, finding themselves alongside Apophis’ flagship who had also survived the supernova. Exodus as an episode largely exists to set up the rest of the three-parter, with the final fight against Apophis about to take place. We see the fleet he took so long to build up destroyed in one fell swoop, his recapturing of the Shol’va Teal’c, and failure to eliminate the Tok’ra who have long conspired against him. For the team the main two threads are Carter’s plan to blow up Vorash’s sun and Teal’c’s longstanding hatred of Tanith and how it blinds him to other issues. For the former, which becomes a longstanding gag on the show whenever her expertise is lately called upon, Carter and her father work to use a Stargate to blow up Vorash’s sun, rushing around against the clock to try and take out Apophis’ fleet. While this pays off for the team it does so at a cost, knocking them into the space between galaxies due to unexpected effects of the supernova on hyperspace. The latter thread is the one most focused upon during the episode, with the hatred between Teal’c and Tanith making itself known in many scenes. Teal’c, usually the most level-headed of the team has a weakness for the Goa’uld, most likely deliberately refusing to pull up during the Al’kesh chase to get another shot at taking revenge on the Goa’uld he knew was still stranded on Vorash. Talking about Tanith his escape from custody is probably the weakest part of the episode, seemingly only done for plot reasons to get Apophis to the planet more than anything else. Despite in the past being great at hunting people down and being willing to lose the few to save the many in this one case the Tok’ra give Tanith a great way to escape simply because the latter tries to kill his host. Overall the episode, while light on plot due to its multi-part nature, is a one that finishes the season off with a bang, filled with a number of memorable action pieces and a finisher that ends up haunting Carter for the rest of the show. · I’d hate to be SG-10 trapped in the pull of the Black Hole when an entire sun starts getting sucked in. · I do love the childishness of O’Neill when he grabs Cronus’ throne on the ship.